Thanks to our friend Brandi Jasmine of Astrology.ca, you can get your free monthly horoscope here. Brandi is also a talented artist. Here’s an example but you can find more of her awesome work at www.bjasmine.com. 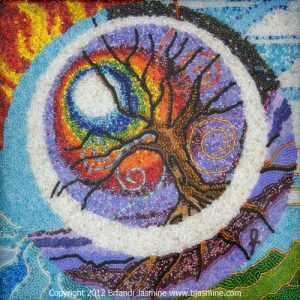 Eye of Solstice is a tribute to the magical changing of the seasons at the Winter Solstice. At the four corners, the four elements are represented. This embeaded piece is mounted on artistic canvas board, and framed with a black wooden art frame. Art size is 10 x 10? square. $800.00 USD, includes shipping in USA or Canada. Please contact me for worldwide shipping estimates. Your subconscious mind will be in overdrive as multiple planets cross paths with your inner self. Deep mysteries, hidden secrets and esoteric knowledge will be freed up for you to play with, but not everything you feel as intuition will manifest into reality, not without help from you. You will first have to make it conscious, then you will have to get out and pound some pavement to make it happen. Pay attention to your dreams, insights, and any information that pops up while you are meditating or relaxing. The best ideas will ring like bells inside your mind. The focus may turn to friends, associations and groups of people who share your interests and political priorities. You may be spending time in a philanthropic group effort that proves to be tremendously illuminating. You will learn a great deal and will make interesting connections to people who may become true friends in the long run. A class, lecture or seminar on communications could be a great way to make the most of the energy this month. You might even be teaching it, not just attending. If this is the case, expect it to be a hugely rewarding experience. Your recent foray into metaphysics and the mysteries of creation, together with the themes of chaos and order, is still a factor in your energy right now, but more practical realities will intrude into your navel-gazing long enough for you to take a good long look at the more mundane path you are on in life. No matter how mystical we get, most of us still have to eat. Your career path is about to get an energy investment, and this could have you spending a lot of time deciding where to spend that extra bonus. The real question is are you satisfied, now that you have realized how much more there is to life? Last month, you and your partner likely spent a lot of time entertaining seemingly incompatible ideas on your career path, and it is likely the two of you concluded that some additional education would be a good idea, if the stars this month are any guide. You might also be thinking that it is time to take a vacation! Either way, you will want to go places together that enhance and expand your experience of and knowledge about the world around you. If you are single, get into a group, either online or in person, whose purpose is to educate people about the wider world around them. Those are the best candidates for romance right now. You may be focusing on death, taxes, passages and mysteries right now, and it is not just that it is April. Your chart is being hit by multiple planets in this area, and it is not a bad thing. In fact, news in these areas will be strangely good. You could be the beneficiary of a will, an unexpected tax refund, or changes in the workplace that leave opportunities available for the quick of foot and will. As a result, you may be spending more time than usual pondering the mysteries of life and the strange synchronicities that make life so interesting at times. Your social calendar will definitely be heating up right now, especially if you have been single for a while. All of a sudden you may have more attention than you know what to do with! You might even be the focus of an unusual love triangle if you are not careful. Just be aware that you are not at your most lucid at the moment. You may tend to be drawn to mysterious, unusual dreamy situations and people that are not too grounded. But this can be a good thing, especially if you are in a creative business. Your personal creativity will be off the charts. If you are feeling the urge to move, renovate or add to your family, now is the time to get busy, in more ways than one. Your energy will be romantic and upbeat, and you will find that there are strange synchronicities that lead you to people who can help you make things happen. An unusual alternative treatment or exercise could also be helpful in improving your health. Take some extra time out for meditation, or to get some extra rest. Investing in your health and wellbeing could pay off in extra energy to get through the day, or improve your job prospects. It is time for you to get busy doing that blog you have been thinking about. Some topic about deep mysteries and psychic powers, I am guessing. If not, you might just find some interesting online discussion groups instead, which will ease the mental itch you have always had for the deep paranormal. You know a lot more than you give yourself credit for. If you do not go outward, you will have to go inward. That is not a problem for your sign, it is one of the things you are known for. But you are getting ready to take all that woo-woo to the next level. You have a big home improvement project, a home move, or real estate investment hanging in the stars this month. Wherever you are at with regards to real estate, home or family, there are some big opportunities now to make some changes. Just be careful you do not over-spend your family budget. There is also such a thing as too much of a good thing. You may be tempted to over-do that beach theme or pick colors that later on prove to be as annoying as they are amusing right now. Take things down a notch in both spending and enthusiasm. Pay attention to the details that may matter later on. This is a great time to get in touch with family members, old friends and estranged or distant siblings. You may find yourself making a lot of long calls with people you were close to in the past. You are likely to be doing a lot of communicating online as well as over the phone. Some of those calls may be surprising. You have had more impact on the lives of others, and you may be pleased and humbled by the power you have to change lives for the better. Take your kudos with grace and humility, but take them! If you do not know what to say, just smile, say thank you, and move on. You may have unusual dreams, visions, insights and synchronicities that could prove to be valuable, or that lead you to information that brings on positive changes in your philosophy, ideals or values. It is a good time to start or return to a journal so you can keep better track of your intuition. You may have too many ideas to keep track of all of them in your head. If you have been feeling isolated, you have the energy to break through and break free of outdated thinking. The challenge with that is not everyone will approve. Use that as your guide to trimming back your social or social media commitments. It is all about you right now. Your image, the way you put yourself into the world, and who you want to spend your time with. You will be finding that some of your ideas are a bit ahead of their time in some circles, but in others, your thoughts could be the focus of attention. Focus on preaching to the choir. Find people who get it. Do not waste your time trying to persuade people who simply lack the capacity to understand what seems painfully obvious to you. Right now, you will be able to spot them easily. Give them a wide berth if you can, and remember that those who do not get it are not being obtuse on purpose.